(CNS): The Cayman Islands government signed its 27th Tax Information Exchange Agreement on Thursday morning at a ceremony in George Town. 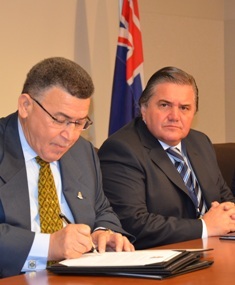 This latest tax agreement which signed by the Cayman Islands premier was with the Republic of Argentina and sign on that country’s behalf by Dr Ricardo Echegaray, Head of the Federal Administration of Public Revenue, who was visiting Cayman along with Under Secretary of Public Revenue, Luis Maria Capellano. “The Cayman Islands recognises the value in strengthening its relationships with Argentina and other Latin American countries,” said McKeeva Bush. “Signing this agreement underpins our commitment to building this relationship and boosting the Cayman Islands’ reputation in the Latin American region, thereby ensuring that we remain a favorable and transparent international financial centre,” he added. Also attending the signing ceremony were Members of the Legislative Assembly; senior officials from the Ministry of Finance and the Cayman Islands Monetary Authority; and members of the Cayman Islands International Tax Cooperation Team. Attending on behalf of Argentina were the Adviser to the Federal Administrator, Dr Guillermo Michel; and a representative from Institutional Communications, Mr Federico Hausvirth.